Since its popularity skyrocketed in the early 1990s, email has transformed from a streamlined form of communication into a facilitator for distraction. The problem has worsened in recent years, now that email follows us through every daily activity on the mobile devices in our pockets. How can business professionals tackle what seems to be this overwhelming task? For many professionals, reaching Inbox Zero, seems like a fantasy that will never be achieved, and anyone who suggests the possibility is the Don Quixote of the office. A few nights ago, frustrated with various aspects of my life coinciding in my inbox, I decided to take a crack at Inbox Zero. The tools I came across in my quest are well worth sharing. Why it is useful: With this application, you can schedule emails to be sent during a later time or date. For example, a message drafted at 2:00 a.m. may be set to send at 8:00 a.m. during normal business hours. Additionally this application can act as a “snooze” button for emails to reappear in your inbox. This feature is useful for night owls, companies that operate in different time zones and follow-up reminders. Why it is useful: Think about the average amount of junk mail received each day. When it becomes second nature to delete certain messages, something must change. This site allows users to scan an email address for subscriptions. I was surprised as to how many listservs I had accumulated over the years, ranging from department store coupons to group newsletters. 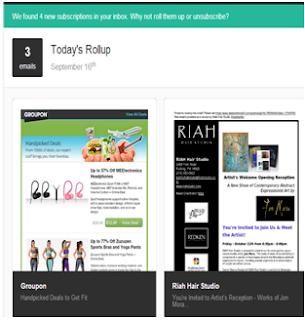 After the scan, the site gives the option to unsubscribe from lists or “add to roll.” Instead of separate emails for each subscription, you will receive one daily digest “roll” email with all of your subscriptions at once. Why it is useful: Have you ever had an email that sits in your inbox because it includes a lengthy article or interesting video that you want to enjoy later? This application allows users to forward such emails to a virtual “pocket” to be read when time allows. Commuters, anyone with future downtime or media junkies will find this valuable. Why it is useful: This is a networker’s dream. An excellent client management tool, Rapportive displays a picture, Twitter feed, and social media links of your email contacts. Users even can add personal notes to each contact to remember for the next meeting or follow-up email. Why it is useful: Call it a senior moment or too much on our plates, the reality is that sometimes we forget things. Follow Up Then serves as a virtual secretary to send friendly follow-up reminders. Simply compose or forward an email to yourself to be read in the future such as events or client reminders. Send the email with when you want the email to appear to @followupthen (i.e. tomorrow@followupthen.com, 28March215pm@followupthen.com). Why it is useful: Sometimes emails have to wait, but the temptation to check your inbox is too great. Inbox Pause halts messages from entering your inbox at work until you are ready to handle more emails. This is especially useful if you are working on a project, out to dinner, with a client or on vacation. Why it is useful: Someone finally had a sense of humor regarding email and developed “The Email Game” to make the process more fun. 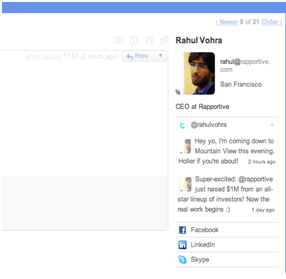 A timer challenges users to beat the clock while reading and responding to messages in order to tidy up inboxes. These tools – along with email basics such as creating proper folders to sort mail, using color-coded tabs, and defining reasonable goals – can help make Inbox Zero a reality. My father can attest to the fact that this process works. Together this past weekend, we trimmed his unruly 4,000-message inbox down to a mere 18 by switching to Gmail and employing some of the aforementioned techniques. So invest in your inbox today and relieve your email angst. Do you have any methods to successfully manage email influx? Share your Inbox Zero tips in the comments.